No more having to go through your workouts lacking energy, focus, and motivation. IdealLean Pre-Workout was created to take your training results to a whole new level of intensity. 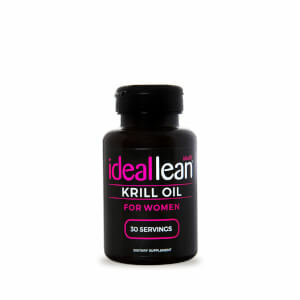 Formulated especially for women, IdealLean Pre-Workout features our unique proprietary IdealLean Fat-Loss Blend with ingredients like Phosphatidylserine and Green Tea Extract standardized to provide 50% EGCG, to stimulate fat burn and help you sculpt a lean, toned physique. Maltodextrin, Citric Acid, Malic Acid, Natural Flavors, Sucralose, Calcium Silicate, Silicon Dioxide, Acesulfame Potassium (Ace-K), Artificial Color. At first I tried the raspberry lemonade and it was okay I finished it before buying a different flavor. However the Lemon Lime is tasty and it still helps me power through my workouts. The preworkout is good; I used the blue raspberry first which was tart and I felt the tingle more in, but then the lemon lime. Honestly it’s not my favorite because it’s sweet, a little too sweet for me but that’s a personal preference. I’m still using it because it does it’s job. I think that this product is worth it especially because you get more for the same price as another flavor. I’m frugal so I don’t mind taking gulps of my preworkout, ignoring the flavor for the money I save and the same great effectiveness. This is the second product I’ve bought off of here and i feel great using the product, I trust it, and I’ve never felt this good when I go into a work out. Thanks y’all! This product contains l-norvaline, which it’s believed to help boost workouts and aid with recovery. Scientists have recently been testing this amino acid, and they believe it is linked to degeneration and damage of brain cells.....please girls do your research before purchasing anything. I love idealfits products and I am very upset this amazing preworkout has this. After a brief hiatus from using supplements due to pregnancy, I used this for the first time and liked the flavor. Not too strong and not too sweet. Ordered both the lemon lime and blue raz pre-workout. Not really impressed with either. The blue raz DOES taste better than the other brands I've tasted, however, the lemon lime is just awful. Both flavors, however, messed up my stomach like nobodies business. Come to find out it contains milk. If you're lactose intolerant (me) this is not the pre-workout for you. Odd to me that it contains milk. As far as how it works, this is where I am least impressed. I didn't get the tingle I was looking for in either flavor. Also, the product made me more sluggish than the other pre-workouts I've used. Not bad took a minute to get used to flavor. But i like the tingles but non jittery feeling. This is a great Pre-Work, definitely feel a difference taking it before my workouts. To get the full effects, I recommend drinking it at least 30 minutes before a workout. It does give the tingling feeling, but once I start moving, it goes away. The taste is fine, I can't call it "Yummy", but it's not overly sweet and subtle enough to get down easily. No problems with the product clumping. It's a great buy. This is the perfect pre-workout for me. I have an overactive adrenaline system, so I don't need much of a push, usually just a little push to get through my second workout of the day. If you are looking for a huge burst of energy, this is NOT for you. I find it to be very mild. It is enough to keep me focused and get through to the end of my workout. I also did tingle the first few times I used it but no longer do (probably the niacin?). I never crash. I don't feel like I've taken anything. I am just more alert (like how I am when I wake up in the morning versus the 4 pm sluggishness). I have tried other pre-workouts and they are way too much for me. With one my heart rate was up to 160 for 4 hours!!! You won't have that with this as it is stimulant free! I will also mention, there's about a week in our cycle ladies where we are more sluggish due to an increase in a hormone that make us sleepy. This is also perfect for that week. If you just need a little boost without a crash at the end then this is perfect for you. I actually got the pink lemonade version which I love but it doesn't seem to be available at the time. So, you'll have to check out some other reviews for best flavors.